If you haven’t as yet heard of hugelkultur, you will soon enough. Its time has come. Which is ironic when you consider that the concept is hundreds of years old. When I learned of it, my first thought was that this harked back to agricultural practices when nothing was allowed to go to waste. Environmentally sound, sustainable and actually quite intuitive, hugelkultur makes so much sense. You’ll see. 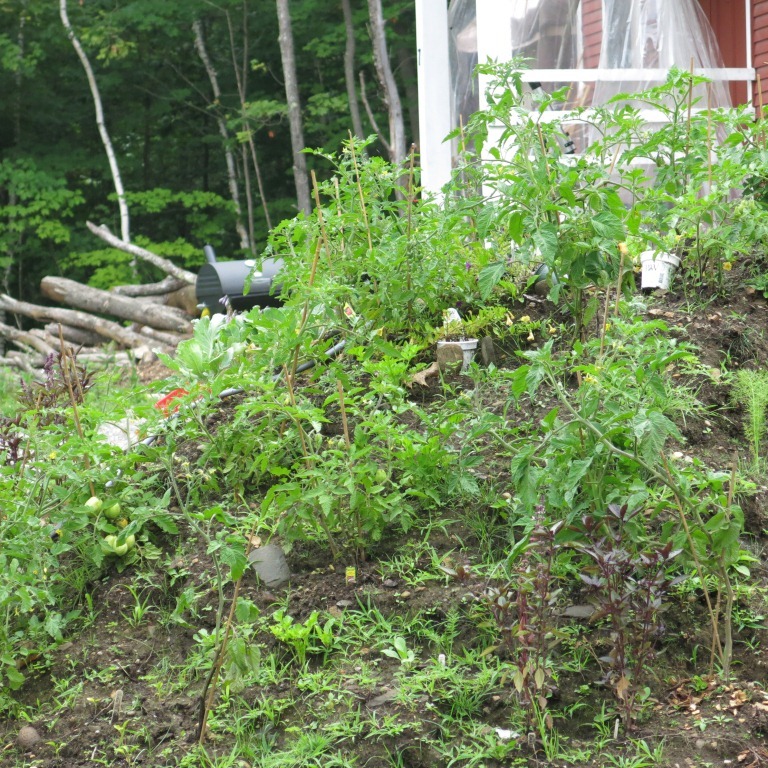 The very first time I saw hugelkultur being implemented was on a property in southern Vermont. What I saw looked, frankly, a bit appalling. The house and its corner lot looked shabby which in itself was not awful – the kind of place I assumed the owners were either physically or financially unable to maintain it. It happens. But what looked to me as deliberately messy was the front right quadrant. 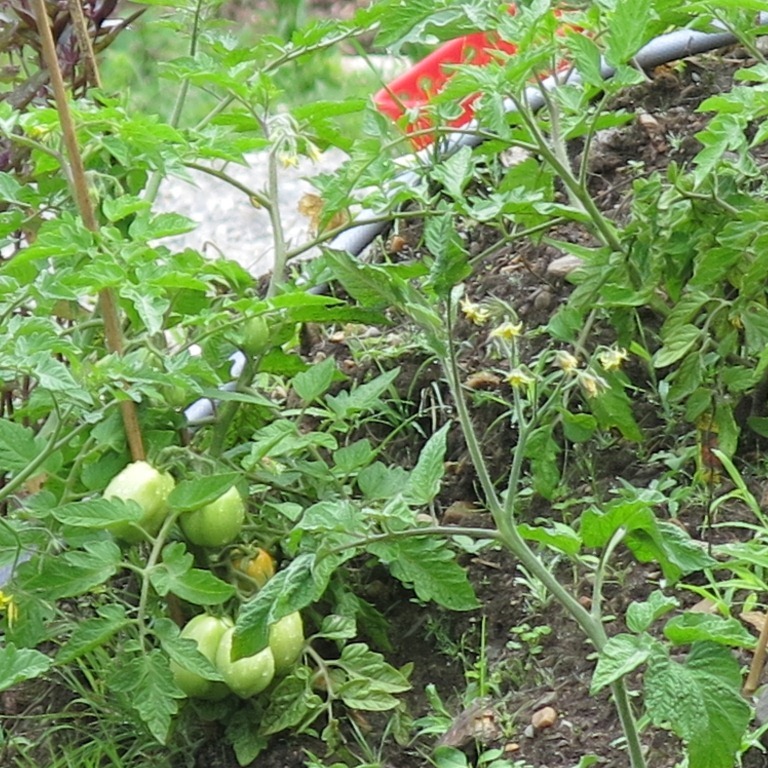 It had these big compost heaps on top of which grew haphazardly some tomato and other plants. There appeared to be no attempt to have it look tidy or purposeful. I took pictures of this because I loved how plants will grow wherever they can. It was a couple of years later that I read about hugelkultur and then recalled this property. It was not the best example but clearly the gardeners knew what they were doing. Just not very attractively. But, who am I to judge? I’m the one with the wild ‘meadow’ after all. Hügelkultur is a German word meaning mound culture or hill culture. It was practiced in German and Eastern European societies for hundreds of years. It is a process of composting in place using raised beds built in layers of wood debris and other compostable plant biomass. The method improves soil fertility, water retention, keeps the soil warm, supports microbial life that in turn enrich the soil, Traditionally, these beds are mounds or hills. The beds can however be built up like more traditional square or rectangle raised beds. A lasagna of sorts! At a time when we are doing our best to recycle, reuse and reduce, hugelkultur is a godsend. 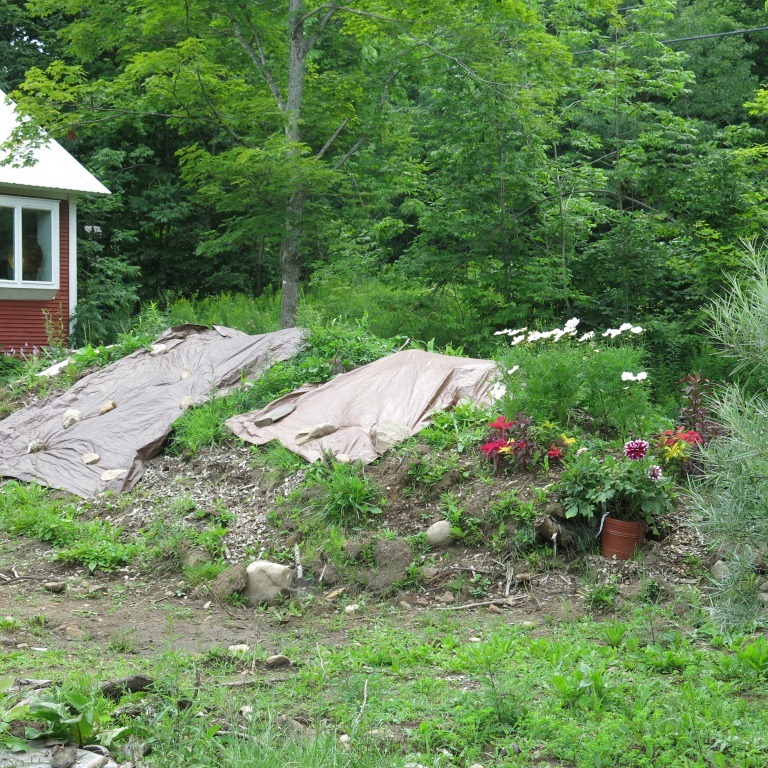 It is in essence a permaculture technique and the beds are raised by layering organic material. Starting with the roughest material like rotting logs, topped with layers of thin branches followed by twigs and such, then grass clippings and other compostable garden waste, and finally, a layer of top soil. As the lower levels in the bed break down, they create most suitable environments for microbes necessary for healthy soil. This in turn permits better moisture retention and slow release of nutrients. As the materials break down, there is some settling but by adding leaf mould and compost regularly, an ideal height can be maintained. Instead of bagging the leaves and twigs for curbside pick-up, the materials can be put to use in the garden itself. No chipping or shredding needed. As the wood decays gradually, it becomes a constant source of nutrients for the plants. In large beds, the nutrient output could be sustained for as long as twenty years. As the composting occurs, the heat generated extends the growing season. When the logs and branches break down, there is an increase in soil areation. Hence, this method requires no tilling or turning over of the soil. Wood can act like sponge. Rainwater is stored in the logs and branches and released during drier periods. Apparently, after the first year, with the exception of droughts, one may never need to water again. Hugel beds also sequester carbon in the soil. In essence, one can start such a bed by simply starting by building the layers from the ground up on the selected site. However, it is recommended that if you are starting on sod, then cut out the sod, dig in a trench with a depth of about a foot and then place the logs. Add the thin branches, the twigs and then the cut out layer of sod face down, followed by the other materials. A bed with steep slopes is the most recommended. This increases the surface area for planting and also avoids compaction from increased pressure over time. The steep sides means higher height and so easy harvesting. Greater the mass, greater the water retention. Types of tree wood make a difference. Hardwoods are best as they decompose slowly but softwoods can also be used. A mix is ideal. Woods that work best: Alders, apple, aspen, birch, cottonwood, maple, oak, poplar, willow (make sure it is dead or it will sprout). Consider woods that are naturally anti-fungal, decay resistant or produce saps and tannins only if they are already well rotted. These are cedars, juniper, yew, eucalyptus, black cherry, camphor wood, osage orange, pine/fir/spruce. Avoid altogether – Black locust (will not decompose), black walnut (juglone toxin), old growth redwood (heartwood will not decompose and redwood compost can prevent seed germination). At this time, my small garden has no spot for experimenting with hugelkultur. But, I’m hoping one or more of you will give it a try. Please tell me if have already or are ready to try this method. I’m so excited about hugelkultur – it could be a game changer in our efforts to restore and maintain a healthy, ecologically sound environment. Bonus picture! A New Dawn rose in my garden. 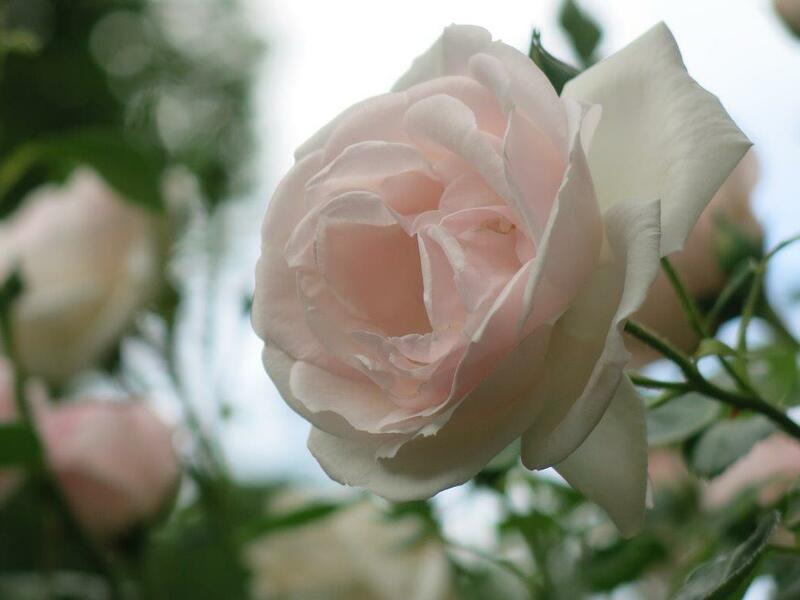 This entry was posted in Move It, The Garden Demystified, Your Garden and the Globe by pgbundil. Bookmark the permalink.